UNITED NATIONS, September 7 -- As Sudan's bombing has spread from Southern Kordofan into Blue Nile State, there has been little response from or at the UN. 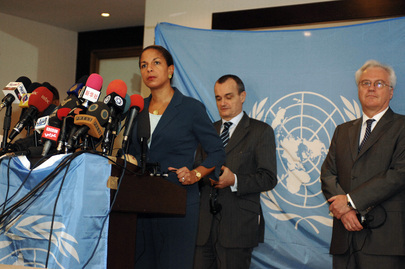 On September 7 Inner City Press asked US Ambassador to the UN Susan Rice what the US would do in the Security Council, which meets on Sudan and South Sudan on September 8, and on Sudan's request to normalize relations with the US including being taken off its state sponsors of terrorism list. Rice expressed concern, but did not address the issue of normalizing relations, nor lay out any Security Council strategy. She said "There was a framework agreement, as you know, negotiated and agreed by both sides with respect to Southern Kordofan. It has been abrogated by the government. These are the sorts of political agreements that have to underlie a lasting political solution in Blue Nile and Southern Kordofan. We're going to continue to push for that." See transcript below. Later on September 7, Inner City Press asked Sudan's Ambassador Daffa-Alla Elhag Ali Osman about the next day's Council session, on which he had just been consulting with the Council's Lebanese presidency for the month. Daffa-Alla Elhag Ali Osman argued to Inner City Press that his country's fight in Southern Kordofan and Blue Nile are linked, saying "the head of the SPLM / SPLA North sector is the defected former governor of Blue Nile while al Hilu is his deputy in Southern Kordofan... We haven't heard of someone elected as governor of a state to defect, and shoot his own army." Regarding the September 8 Council session, Daffa-Alla Elhag Ali Osman told Inner City Press "I think they will get a briefing." But how? Another Council diplomat admitted that the UN knows almost nothing of what is happening in Blue Nile State, since UNMIS expired on July 9, and now with even humanitarian access blocked. Inner City Press: in Sudan over this three-day weekend, the Government has outlawed and locked up members of the SPLM, which is the main opposition party, shut down a newspaper, and I am just wondering what’s the, at the same time, Ms. Wallström, the Special Representative on Sexual Violence in Conflict, praised the Government for it, its new openness to journalism for two pardons. Is there any UN response to what is seen by many as, as a major crackdown in, in a country with at least one-and-a-half UN peacekeeping missions there? Deputy Spokesperson del Buey: Well, we’re looking into what’s happened and we are trying to get a report on that. But I don’t have any further information on that right now. Sorry. Twenty four hours later, before Susan Rice's September 7 stakeout, no information had been provided. Inner City Press: ...in Blue Nile state, it's said that the UN can't even get humanitarian aid in there. What, I'm wondering, what's going to be tried to be done at the Council? And also how this relates to the US moves described by Ali Karti as normalizing relations, being taken off the state sponsor of terrorism list. Is there some...how are these related? And also there's this incident in South Sudan where Benedict Sunnoh, who is the head human rights official in South Sudan, was beaten by South Sudanese police, hospitalized. This was criticized by Navi Pillay. I didn't know if the US had any view of that, and views it as a one off, or as a bad sign? Ambassador Rice: Well, first of all we're very concerned about the deteriorating situation in Southern Kordofan and Blue Nile. We have expressed our condemnation and outrage at the escalation of violence, particularly the aerial bombardments that have intensified by the government against various targets, particularly civilian targets. We see the fighting and the spread of the fighting to Blue Nile as a very troubling development, particularly when coupled with Southern Kordofan and what's transpiring in Darfur. And we have underscored particularly to the government but to both parties the necessity of cessation of the fighting, full humanitarian access, and a negotiated solution to deal with the underlying issues, which have been put aside by the government. There was a framework agreement, as you know, negotiated and agreed by both sides with respect to Southern Kordofan. It has been abrogated by the government. These are the sorts of political agreements that have to underlie a lasting political solution in Blue Nile and Southern Kordofan. We're going to continue to push for that. With respect to the reported allegations against the UN human rights official, obviously we strongly condemn any excessive use of force by authorities in any case, in this case in South Sudan, against civilians of any sort. Now we don't know fully the details of what transpired in this instance. We understand that the United Nations is looking into it carefully. From a US point of view we have expressed our grave concern to the Southern Sudanese authorities about the treatment of this individual regardless of the circumstances preceding and in that moment may have been. And I think SRSG Johnson has also conveyed the United Nations strong concerns. Because Rice said "the United Nations is looking into it carefully," Inner City Press went and asked UN deputy spokesman Eduardo del Buey if the UN knew anything that would make the attack on Sannoh other than what it appeared -- an attack on a human rights observer -- and if there is, in fact, any ongoing UN inquiry. Del Buey wasn't aware of one but said he'd check. "On Benedict Sannoh's injuries: he suffered what his hospital medical report described as "a blunt trauma to the head," as well as injuries to his back and legs. However, fortunately no bones are broken, and it looks like there will not be any permanent injuries. He was released from the UN hospital in Sudan after five days and is now recuperating outside the country. On the NGO you refer to, perhaps you can give more details? It is extremely common for UN officials, especially human rights and humanitarian officials, to have NGO backgrounds, -- that's where they gain their initial experience in their particular fields, so I'm not sure what your point is here." Without in any way linking it to Mr. Sannoh's injuries, the reference was to his concurrent service on the advisory board of an NGO, Fambul Tok, click here for that. Generally this is not permitted for UN system staff. Inner City Press asked if some waiver was given but has yet to hear. Who will brief the Council on Southern Kordofan on September 8, and what will come of it? Watch this site.